Recorded at Carré Bleu, Poitiers, France on April 12, 2012. Cover photo by Bénédicte Gallois. Created in 1994, the duo of Joëlle Léandre and Pascal Contet was instantly praised both by the critics and the public for the strength, inventiveness and creativity of the two musicians on their first album, published by Concord/7 Media. 11 years later, Léandre and Contet met again in the studio to record their second CD for Clean Feed, Freeway, built on a series of twelve scenes. 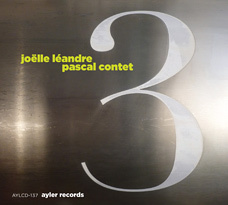 Recorded live at Carré Bleu in Poitiers in 2012, the 2014 release of 3 celebrates the duo’s 20th anniversary, and again, their emancipated and “comprovised” chamber music (incorporating all boldness – microtonality , dissonance, polyphonies, … – but never indulging in a mere exhibition of technique and virtuosity) surprises us by tracing its path in the depth, intimacy and resources of a musical friendship where listening remains inexhaustible.